New jobs created in September amounted to less than half of the 125,000 new entrants into the labor force (i.e. people looking for jobs). So even in the relatively near term, the rejoicing may qualify as "irrational exuberance," and analysts from a variety of points of view have voiced concern about the long term effects of Bush administration policies on the American economy. Writing in the Boston Globe, Tom Oliphant noted that the last time the GDP experienced quarterly growth comparable to this year's third quarter was during the Reagan administration in 1984, "... a reelection year. In part that reflected a combination of tax cuts taking effect and an investment recovery spurred by a late-1982 budget deal between Ronald Reagan and Congress that at least promised to keep the deficit from being too ridiculous and prompted the Federal Reserve to start stimulating growth." Oliphant cited the "unprecedented amount of budgetary and monetary stimulus applied to the US economy over the last 30 months," and suggested that the question is not whether the economy will respond, but whether the recovery is perceived by the public as improving their standard of living. That, he argued, will require more jobs, and more after-tax inflation-adjusted income -- something that may be difficult to achieve. Although consumer spending for the third quarter of 2003 rose at an annual rate of 6.6%, income grew by much less. In particular, wage and salary income grew by only 0.65% in the six months ending in November (adjusted for inflation), and by 0.8% in the third quarter. The difference was made up largely by consumer borrowing, which increased in August at an annual rate of 5%. At the moment, however, consumers seem content to borrow, in part, apparently, because interest rates are so low. The government is borrowing at an unprecedented rate, also, having borrowed $374 billion over the last fiscal year. "This is unsustainable," Paul Asworth, international economist at Capital Economics, London, told the Guardian (UK), "and we expect consumption growth to slow markedly in the fourth quarter." Indeed consumer spending in September fell by 0.3%, or 0.6% when adjusted for inflation, after having increased by 0.8% in July and August. Spending on so-called durable goods (cars, large appliances) dropped by 4.6% in September, after having increased 3.8 and 4% in July and August. Joe Liro of financial research firm Stone & McCarthy told the Washington Post, the "data extends the trend of weak or tepid income growth, which has become a very worrisome problem now that the joint stimuli of tax cuts and mortgage refinancing have played out." Personal income for September (salaries plus rents, investment earnings, etc.) was up by 0.3% -- the same increase as in the month of August. But when adjusted for federal taxes paid, the resulting "disposable income" dropped by 1%. Federal tax payments actually rose by $110 billion in September. Adjusting for inflation, disposable income dropped by 1.2% in September after rising by 1.4 and 0.7% in July and August. According to Liro, the inflation adjusted 0.6% drop in spending was 0.5% below the third-quarter monthly average, and provided "no momentum but a drag on both fourth-quarter personal consumption expenditures and [economic] growth. Stone & McCarthy expect fourth quarter spending to rise at an annual rate of only 1.5%, said Liro, requiring very strong gains in other sectors of the economy -- such as business investment, housing, exports, and government spending -- if the economy is to achieve the annual growth of more than 4% as some economists have predicted. Growth in exports and government spending, however, have side effects that in the view of some economists are more harmful than an economy that is sluggish for a short term. And if productivity growth remains as strong as it has been recently, increased business investment may not translate into more jobs, even while it improves the GDP. For instance, while the GDP was spurting during the third quarter of 2003, hours worked remained flat or declined slightly. Writing in Newsday recently, James K. Galbraith, who teaches at the University of Texas, Austin, compared the Bush economic policies to its policies in Iraq. "Here the "invasion force" is the power of war spending and the "improvised explosive device" is the consumer debt bomb," he wrote, arguing that a high growth rate would need to be sustained for a year in order to drive down unemployment. Galbraith suggested that most consumer spending resulted directly from tax rebates, which will not repeat during the next quarters, and because consumers fear that low interest rates will not last. Anxiety about jobs or retirement, he argued, will make it much more likely for consumers to keep their money in the bank. That in turn will lead to slow growth, with another artificial spurt from re-stocking military equipment and next year's tax refunds kick in. Even if some jobs are created, Galbraith believes Bush & Co. will finish their first term with the worst record on job creation since Herbert Hoover. And even if Bush wins, Galbraith argued, he will not lead the nation back to full employment. First, full employment will require much more business investment than seems likely given the current trend. The level of investment needed rivals that seen in the 90s when the nation was captivated with the promise of technology. Such investor exuberance seems unlikely over war spending, Galbraith suggested. "Those daily pictures of burning Hummers can have a bad effect on the mood of the investor. 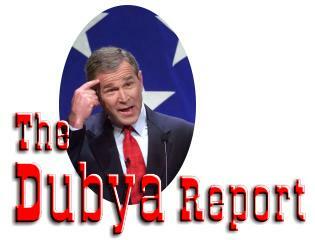 Indeed this could be, in the end, the largest economic cost of Bush's war," he wrote. Second, the administration and their advisers come from the ranks of big business: oil, mining, timber, pharmaceuticals, etc. They are more interested in market power and government contracts than domestic consumer sales, Galbraith suggested. "...[F]ull employment doesn't matter as much to these folks as it does to small business, retailers, and working people." The comparison of GDP growth spurts is not the only comparison being made between economic policies of the Reagan and Bush administrations. Critics point out that it took a decade of government budget discipline to recover from the deficits built up during the Reagan era. Bush supporters point out that the US current-account deficit was corrected by 1991, and despite the stock market crash of 1987 there was no global recession. This time, though, the situation, particularly outside the US, is very different. The Reagan and Bush administrations both began with the country in recession. In 1981 the recession was more severe, but the turnaround was quicker. Fueled in part by tax cuts, domestic demand grew nearly 15% between 1982 and 1984, compared to 3% in Europe and 5% in Japan. Interest rates were high in the US during the early 80s, and the dollar rose in value in foreign exchange markets, which led to increased trade deficit. The Reaganites, like the Bushies, argued that the trade deficit merely reflected an attractive investing climate in the US. By 1985, however, members of Congress were blaming Japan for decimating the US manufacturing industry. After months of secret diplomacy, on September 22, 1985 then Treasury Secretary James Baker announced the Plaza Accord -- an agreement with America, Japan, West Germany, France and Britain to drive down the dollar. Each country agreed to take specific actions: Japan promised fewer restrictions on the value of the yen, Germany promised to cut taxes, and the US promised to reduce the federal deficit -- a promise it did not keep. Nonetheless, the agreement was apparently successful, and within two years the dollar had fallen more than 50% from its high point in February 1985 relative to the D-mark and the yen. The Plaza Accord may have been too successful, and fears grew that the dollar was losing too much value. Hence the 1987 Louvre Accord, to stabilize the value of the dollar. The devalued dollar and growth abroad had meanwhile reduced the current-account deficit, and after the mild recession of 1991, it was a surplus. The problems the current administration face differ both in scope and context. At the start of the Reagan administration the US was still the world's biggest creditor. Even at its peak in 1987 the current-account deficit was 3.4% of GDP. By contrast it was greater than that when Bush took office. In the 1980s the current-account deficit had been increasing for four years when the Reagan administration decided to intervene. And it clearly resulted from the surge in investments following the recession of 1981, combined with reduced savings as the budget deficit rose, both of which combined to drive up the value of the dollar. According to the Economist, the Plaza and Louvre accords are viewed by Japan as the source of today's international economic problems; Europeans view them as "clever American tricks in which the Reagan officials pushed the burden of dealing with their past profligacy on to others." International coordination of economic policies is much more difficult now than it was in the 80s. Central banks in Europe and Japan are now more independent of their nation's politics. And a global currency market that exchanges nearly $1 trillion daily renders much government intervention ineffective, except to marginally reinforce existing economic trends. The US also has many more significant trading partners. With economies that have been stagnant for years, neither Germany nor Japan are likely to facilitate a shift in demand away from the US, as occurred in the Reagan era. And Asian countries are resisting allowing the dollar to depreciate relative to their currencies. The Bush administration claims to support a "strong dollar policy," Nonetheless, in his 6-month report on currencies to the Senate Banking Committee, Treasury Secretary John Snow stopped short of criticizing Japan and China for manipulating their currencies, but did call for exchange rates to be set by the currency markets. "We are not happy with the way the Chinese deal with their currency. We are engaged in changing it. I think we're making real progress," he said in a statement. The administration has indicated that it believes that the official exchange rate for the Chinese renminbi (also known as the renminbi yuan, or just the yuan) vs. the dollar makes the Chinese currency artificially cheap, which is an economic advantage for China. By signaling his support for lower taxes and higher public spending in the next year that could reach as high as $130bn (£88bn) - 1.3 per cent of gross domestic product - [Bush] threw the US administration's weight behind the proposition that a temporary deficiency in aggregate demand should be met by a shift in government finances from surplus to deficit. Economist Paul Krugman and others have argued, however, that supporters of the Bush policies are not even good Keynesians, in that they ignore a key aspect of Keynes' view on deficits. Keynes proposed that the government actually maintain two budgets, a current budget and a capital budget. Over the long term, the current budget was to be in balance or surplus; in fact Keynes anticipated that surpluses in the current budget would fund public investment or reduce public debt. And it was public investment, not budget deficit tinkering that would help achieve full employment. "Keynes never said it was okay to run deficits forever. He said that deficits are good for stimulating the economy temporarily during downturns," Krugman told KPFK's Terrence McNally in a recent interview. Of the projected $500 billion deficit, Krugman estimated only $60 or $70 billion would disappear even if the economy recovers. "We have the finances of a banana republic right now. If current tax rates and current programs continue, at some point the U.S. government will simply be unable to pay its debts – and long before that point happens, industries will pull the plug," Krugman said. Moreover, Krugman noted that foreigners are currently lending the US money to cover its international debt -- an amount roughly equal to the domestic deficit, but are unlikely to do so forever. "Some people say we now have a faith-based currency. I think we have a faith-based government. People believe that we're going to get our act together, but there's no sign that we will." In Krugman's view, the financial health of the federal government is worse than that of the state of California, where the legislature must by law balance the books. Krugman warned that at some point foreign investors may no longer allow the US to continue rolling over its debt, triggering something like bankruptcy. The US budget deficit is proportionally greater than that of Argentina prior to its fiscal crisis of 2001, and the trade deficit is proportionally greater than that of Indonesia in 1997 when the collapse of the Thai baht caused a banking system failure. ...[Y]ou have to do the things that governments always do during recessions, but this government hasn't. Aid to state and local governments so they aren't laying off schoolteachers and firemen just when the economy is slumping. Public works programs. "I don't know what tricks the Administration will come up with to divert people's attention, but I think that unless a candidate is really prepared to come out swinging, to say these people are doing the wrong thing by the country, there's no chance," Krugman added. As long as the jobs that are being created pay less, offer fewer benefits, and carry less security than the jobs that have disappeared, former Columbia University Business Journalism Fellow Jim Jubak, who now writes for MSN Money, has written "the average U.S. citizen who works for a living knows that this economy is still crummy...."
Even as a net 57,000 additional jobs were created in September, the manufacturing sector lost 29,000 jobs. Most of the new jobs were in the business and professional services sector (66,000) along with 15,000 jobs in health care and social assistance, and 15,000 in retail. Outplacement firm Challenger, Gray & Christmas estimates that the average manufacturing job pays $650 per week, or $34,000 a year, while the average retail job pays $373 per week, or $19,000 a year. " Even as the recovery starts to pick up speed, the U.S. economy is shedding $34,000-a-year jobs and replacing them with $19,000-a-year jobs," Jubak wrote. Moreover, workers taking new jobs as well as those staying in their current jobs are paying more out of their paychecks. Over the last year 56% of employers increased the amount employees contributed to healthcare, either premiums, deductibles, or co-payments. 18% now charge an additional $100 if an employee's spouse is not insured with his or her own employer. 12% of employers arbitrarily reduced benefits over the past year, and an additional 6% plan do do so during the coming year. 45% of US employers reduced their salary budget over the past year, and 16% eliminated or significantly reduced their budgeted bonuses, according to the HR firm Watson Wyatt. Jubak's research showed that many companies are using the tight job market to in effect exact subsidies from employees. For instance, Hewitt Associates estimated that the cost of health insurance will increase by 13% in 2004, but employee healthcare costs will increase by 23%. Morgan Stanley economist Richard Berner noted to the Economist that US businesses have reduced their workforces for the past two years, after overhiring during the 90s. Now that profit margins have improved, and with excess employees trimmed, he expects hiring to resume. Supporting Berner's view, the September job increases were all from the private sector. Many of the added jobs were temporary workers, whose hiring often anticipates in increase in permanent jobs when economies start to recover from a recession. But Jubak suggested that the process of cost-cutting, restructuring, and cutting back jobs "looks like it will be a permanent part of life for employers and employees for the foreseeable future." Part of that process involves shifting jobs to areas of the world with the lowest wages. For instance, starting salary for an engineer in the US is around $43,000 a month, while in India it may be as low as $7,800. The shifting of jobs happens in waves; in the recent past information technology jobs in the US shifted to China, and then to Russia, and then to India, with each step lowering employee wages. India is now facing competition from the Philippines and Vietnam. Moreover, the measured unemployment rate of 5.9%, while not high by historical standards, does not take into account the large number of people who have stopped looking for work. Economist Paul Krugman noted recently that by measures such as the length of time it takes laid-off workers to find new jobs, the current job market is the worst in 20 years. The recent economic slowdown was not a typical recession. A study by Federal Reserve economists Erica Groshen and Simon Potter found that, in contrast to the recession of the 1980s when the reasons for job losses were evenly split between cyclical factors (e.g. demand for the firms output was temporarily reduced) and structural factors, current job losses are mostly due to structural factors. These factors include productivity gains from increased use of technology, and shifting production out of the US. Jobs lost for these reasons will not become available even if the economy improves. Workers will have to seek employment in new firms and new industries -- a process that takes longer than returning to one's last employer. The Bush administration's recent attempts to pressure the Chinese into revaluing their currency is an attempt to slow the pace of one component of structural change, namely foreign competition. These efforts are likely to spread to the service industries as well; the Economist reports that some states have ordered their agencies not to use call centers or similar services in India. In the view of some analysts such actions merely forestall the inevitable, while avoiding the factors that directly affect the hiring drought. Chief among these is the increase in non-wage costs, such as health care. In a recent BBC interview, Ellie Wegener, of the Employment Support Center in Washington, DC agreed that this recession is different. Wegener should know -- she founded the Support Center during the severe recession of the early 1980s. "Many more middle income, middle management workers have been hit," she said. Typical of this recession's unemployed is Jim Morrow, out of work for 15 months after 30 years of employment. Morrow is adjusting to living off his wife's income, but acknowledges the emotional impact. "First of all you get angry, then you go through a depression, and then you wonder what it is that you want to do," he told the BBC's Kevin Anderson. Morrow, who voted for Bush, does not think the administration's economic policies are working, and believes that the economic situation could keep Bush from being re-elected. "The economy cannot be in this position at this time next year for him to be re-elected," Morrow said. Administration supporters have pointed to increased corporate profits and stock valuation as justification for the Bush economic policies. By early December the Dow Jones Industrial average was up 15% for the year. Corporate profits rose at an annual rate of 40% in the third quarter of 2003. Yet, as was noted in discussions of the tax on stock dividends, the majority of Americans own at most a few thousand dollars worth of stock. Using figures from the nonpartisan Congressional Budget Office, Krugman suggested that 8% of corporate profits benefit the poorest 60% of American families, while 67% benefit the richest 5%, and 49% benefit the richest 1%. If economic growth continues to fail to produce jobs, it will lend credence to Democratic claims that Bush economic policies benefit only the rich. "If the economy is bright and the American people believe their economic prospects are good, it is going to take a bolt from the blue to drive this president out of office," said American University's Alan Lichtman. "If the economy is questionable, then everything is called into doubt," he said, adding, "The dark lining in this silver cloud of growth is the lack of jobs." The Globe's Oliphant noted that household finances in general are in even worse shape than federal numbers indicate, because widespread deficits in state and local governments, some caused by cuts in federal aid due to the Bush tax cuts, have led to property tax increases. "Per capita disposable income," (the total value of personal income in the nation, adjusted for taxes and inflation, and divided by the number of people in the country) has remained almost flat during the Bush presidency. In the first quarter of 2001 per capita disposable income was $24,585; in September of this year it was $24,874, or an increase of 5.1 percent in three years. In February of this year the figure was $24,585; in August it was $25,211 or a little over 1% for the year. According to Oliphant, at that rate "historically during an election year, presidents and parties in power tend to be turned out of office. The rhetoric in campaigns may be dominated by talk of the fast and of the future, but voters have an understandable habit of reacting to what is happening to them in the present." On October 28, 1980, in the second presidential debate of the 1980 campaign, Ronald Reagan introduced a measuring tool that has been used by and applied to politicians ever since. He asked the viewing audience rhetorically, "Are you better off than you were four years ago?" Reagan suggested people look at the "misery index" in answering the question. The misery index was developed by Arthur Okun, chief economic adviser in the Johnson administration. It combines the most recent month's unemployment figures with the percent change in consumer prices over the last 12 months. The measure is based on the notion that if the combination of unemployment and inflation increases, people will be unhappy regardless of which component contributed more to the increase. During the Ford administration the misery index was 13.1, consisting of 5.5 percent inflation and 7.6 percent unemployment. In October 1980 when Reagan posed the question to television viewers, the index was 20.2: 12.7 percent inflation, plus 7.5 percent unemployment. Reagan defeated Carter in part because he used the misery index to symbolize the economy as a whole. In 1984 Reagan was able to point to a lower misery index as evidence that the economy had improved during his administration. With 4.3 percent inflation and 7.3 percent unemployment the index stood at 11.6 percent. During the Bush I administration the misery index increased from 9.6 to 10.6, allowing Bill Clinton to criticize "Poppy's" stewardship of the economy. By October 1999 the index was at one of its lowest measures since the 60s: 2.6 percent inflation with 4.1 percent unemployment for a total of 6.7. In early November 2003, the misery index stands at 8.2 percent, comprised of a lower inflation component of only 2.2 percent, but much higher unemployment of 6.6 percent. The increases in the hunger rate are ironic, given that the Centers for Disease Control and Prevention report that nearly 65% of adults and 13% of children are overweight. University of North Carolina professor of nutrition Barbara Laraia observed to the Associated Press (AP) that hunger and obesity can coexist when families purchase food that is high in calories and low in nutrients. "They're dependent on foods that are going to make their bellies feel full, rather than on nutrients," she said. Families often spend income on fixed expenses, such has housing and utility costs, before buying food. Jim Weill of the Food Research and Action center suggested to the AP that families were still recovering from the effects of the recession in 2001. He also noted that the minimum wage had not been increased from $5.15 an hour since 1997. The Department of Agriculture's hunger survey was released the day after Bush praised his administration's economic policies at a reception in San Antonio Texas. ...[W]e're returning more money to the people to help them raise their families. ... With all these actions, this administration has laid the foundation for greater prosperity and more jobs across America so that every single one of our citizens can realize the American Dream. Commentator Christopher Brauchli noted that Bush was not referring to the dream of being free from hunger, or the dream of having a job. "... [E]ven though hungry people were only required to pay 15 percent tax on their dividends and, in some cases, only 10 percent on profits they made when they sold their stocks and bonds, they were still going hungry," he wrote. Moreover, Brauchli observed, in his two appearances on October 30, one in Columbus, OH and the other in San Antonio, TX, Bush raised $2.6 million for his re-election campaign. In one day Bush raised as many dollars as the number of jobs lost so far during his term in office. "President Discusses War & Economy with Reporters" White House News Release. 8 Mar. 2002. Anderson, Kevin "Workers' woes dog President Bush" BBC News 4 Nov. 2003. "1980 Presidential Debates" CNN AllPolitics. 1996. "Keynes Revisited" Financial Times 9 Oct. 2001. Reprinted by BizEd (UK). Moudud, Jamee K. "State Policies and the Warranted Growth Rate" The Levy Economics Institute of Bard College. 2002. McLeod, Ross H. "Dealing with Bank System Failure: Indonesia, 1997–2002" Indonesia Project, Economics Division. The Australian National University. 30 Jan. 2003. See also Eleftherios Botsas's The ABC's of the Foreign Exchange Market.